Police/Incident Report: It takes at least 4 business days to process police reports for release. To obtain a copy of reports, call the Smithfield Police Department Records Division at (401) 231-2500, extension 115, between the hours of 8:00 a.m. – 4:00 p.m., Monday through Friday, to ask if reports are ready. You may pick up reports during the hours mentioned above or make arrangements to have reports left out for you after normal business hours. The cost is .15 cents per page, payable by cash or personal check. Credit/Debit cards are not accepted. Crash Reports: There are 2 options for obtaining crash reports (also known as collision or accident reports). 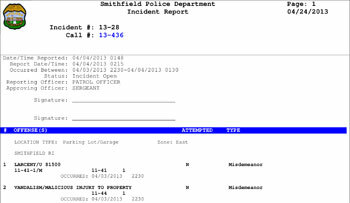 Option #1 – Crash reports can be obtained at police headquarters through the Smithfield Police Department Records Division. After 4 business days from the date of the crash, call the Records Division at (401) 231-2500, extension 115 (8am-4pm Monday-Friday), and ask if reports are ready to be picked up. The cost is .15 cents per page, payable by cash or personal check. Credit/Debit cards are not accepted. You may make arrangements with the Records Division to pick-up a report after 4pm. These reports are payable by check only. Option #2 – Crash reports can also be obtained by going to www.BuyCrash.com, which provides online access to crash reports. In most cases, crash reports are available 72 hours after the report was taken, with the exception of crashes that remain under investigation (which cannot be released until the investigation is completed) and fatal crashes (which must be obtained through the Smithfield Police Department Records Division). The Smithfield Police Department encourages motorists, businesses, insurance agencies, and engineering firms to utilize BuyCrash.com for easy, online access to crash reports. BuyCrash.com allows individual or multiple crash reports to be purchased with major credit cards or with a pre-paid account. To purchase an individual crash report, go to www.BuyCrash.com and follow the simple process. To purchase multiple reports at once, you must set up a subscriber account. To set up a subscriber account, click on “Business Account Login”.